So--I work in a cube. There are definitely things I love and things I hate. I love having just enough privacy but there are no windows! I was talking to my friend who just relocated to a new job and the first thing she told me was,"I miss my privacy!" If you're going to be spending 8+ hours a day in a small space, you have to make it fun and bright! Here's my short list of essentials for any cube. 1. Thank You Notes: The #1 thing I always have at my desk is thank you notes. Because we're doing frequent giveaways/seeding to bloggers, fans, followers etc., I'm always throwing things in the mail and make it a point to personally thank everyone and give it a personal touch. 2. Molskine/ notebook: A must for any meeting and easy to carry when you don't need to bring your laptop. 3. 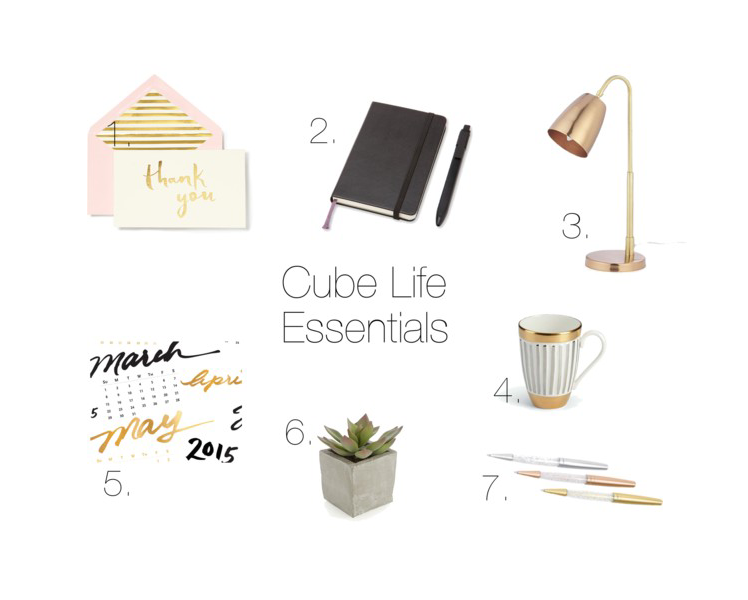 Desk lamp: If you're in a dark cube, lighting is a must! I not only have a desk lamp, but I have a Happy Light too! 4. Personal Mug: My office supplies mugs, buuuut I'm all about having my own personal one that is only used by ME! 5. Calendar: I'm scheduling content to go out on a daily basis and am constantly looking up at my calendar. It also adds a bit of color on my dark gray cube walls. 6. Succulent: I discovered these cute guys at World Market and best part is they're fake! I don't have to worry about them suffering from lack of sunlight! I love the added feel of having plants around me in Cubeland. 7. Pens: I've got a ton of pens at my desk. I make sure to have multicolored pens around for note taking. Bottom line, no matter where you work, it's always important to have a clean, happy space that can foster your creativity. Did I miss anything? What's at your desk that I should add to mine?